Top ‘O’ the Morning to Ya! When I “finish”a painting it’s always an arbitrary point in time. Truthfully, I could always keep working on a painting. But if I let the work speak to me it always says at some where along the line, “Stop here. I’m good.” Of course, then I step back and think “well, I could keep going on that corner” or some such thing. 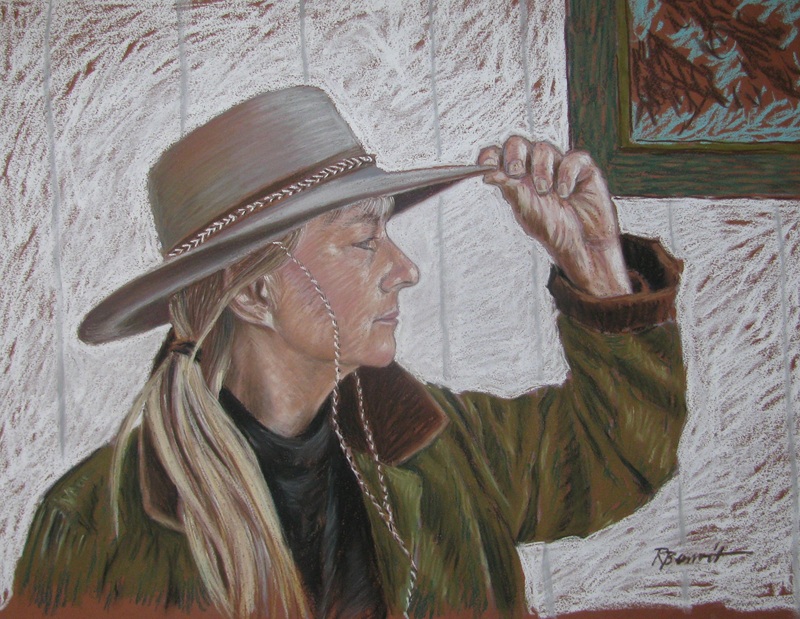 When I look at this felt hat painting I have that thought. But then I have a second thought. It’s “what did I set out to accomplish?” With this one I wanted to give everything to the face, hat and hand. And I did. And it came out the way I wanted it to. I think about the great portrait painters like John Singer Sargent. He felt comfortable with slapping on the paint in great swirls and gestures everywhere except in one chosen area. If Mr. Singer feels comfortable doing that, well, so do I. Very nice Renée and I like the hair also. The hand and the brow draws my eye. Nice work. Thank you! Ron is being so very nice and letting me use his gravatar image as a basis of my next drawing. You know, the one with him in a shearling ear flap cap and anorak. By showing a little snap of the portrait in process, you create my anticipation. The finish delights me like a child swinging high in the sky! All I can really think to say is, again! Please push me again! *ahem* I know that’s a weird way to view you art but……………………………….. Okay now that I’ve read the post. I very much like that the background is non-descript. I think that if you were to have added anything more it could have taken away from the, um, from my feeling of rounding a building and I didn’t know she was there. Perhaps, yes, she saw me and greeted my surprise with a lovely hat tip. If I could express myself in words the way you create……………..